2018 Jean O’Connor-Snyder intern Katie Eaves reflects on the value of a new third space to the community of Marion, Alabama where she is living and working this summer with local nonprofit Renaissance Marion and Main Street Marion. “How are you doing? Welcome to The Social!” These are the first words customers hear after pulling into a parking space and opening the store’s pink antique door. 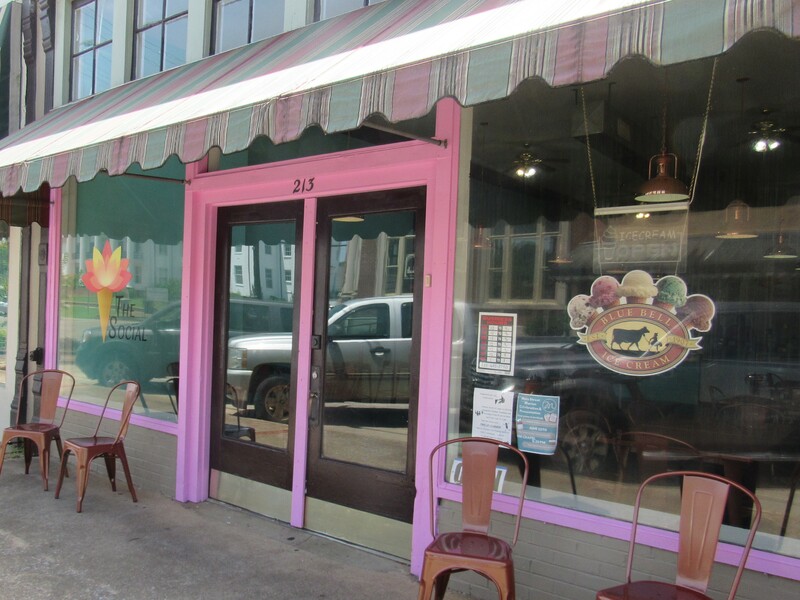 Those who visit the ice cream café at 213 Washington Street on the square in downtown Marion, Alabama, are greeted with a joyous salutation, friendly faces, and walls painted bright blue and crisp white. In the summer of 2017, Betty’s daughter was selected to work with Teach for America and needed to look for a place to live in Marion. Owner Betty Cadore went to Marion with her daughter to help her find a new home. Little did she know at the time, but she would soon find her new home in Marion as well. During their first visit, Cadore immediately saw a need in the Perry County community: a place for everyone to socialize. She chose to relocate from New Haven, Connecticut, to Marion after realizing that she was meant to fill this gap. This is when she decided to open her own small business to provide a space for socializing. For her, that business was an ice cream café. The Social creates a physical space for the close-knit community to hang out together, which increases the citizens’ morale. Cadore is a retired correctional nurse. She felt a calling to serve the people of Perry County by satisfying their sweet tooth while providing citizens with a cool place to get together. The Social currently offers ice cream flavors like Vanilla, Strawberry, Banana Pudding, Pistachio Almond, Black Walnut, Salted Caramel, Krazy Kookie Dough, and Chocolate Peanut Butter Cookie Dough. The menu also features cookies, brownies, sherbet, sodas, and coffee drinks. The team plans to continue expanding selections in order to better serve customers. After much hype, the excited residents of Perry County eagerly welcomed The Social when it opened in early May 2018. Cadore said she is pleased her business is creating an atmosphere where people can hang out, play games, watch television, host birthday parties, and hold meetings. Within its first month of being open, The Social quickly established a set of regular customers, making it clear they are accomplishing their goals. Cadore said each customer quickly becomes a friend. The store’s hours are currently Monday-Saturday from noon to 9 p.m. and Sunday from 1 to 8 p.m. The Social is one of Marion’s businesses that emulates the campaign of #OneMarion. For more information about The Social, visit their Facebook page at https://www.facebook.com/TheSocialAtMarion/.